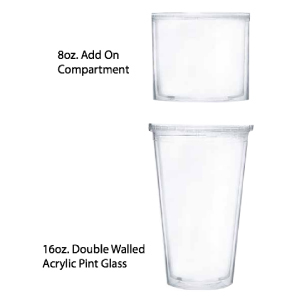 The Build-a-Cup is a 16oz Double Wall Tumbler that allows for custom inserts that you can give away with various programs/events. For example, guests would receive an additional module (with branded insert) for their cup each time they visit or participate in a program; each module would have a different insert to help remember the event. As people visit your, they can add modules on to the “Build-a-Cup” and show them off to their friends, family, and on social media. You ccan make interactive programs that allows guests to collect inserts with their favorite teams, events, coupons, etc.